How to Add HTML Sitemap Page in Blogger Blog? when you search this keyword in google. I am sure that you wanna to make an HTML Sitemap Page in Your Blogger Blog Platform or your blog, right? It does not matter, you are a Wordpress or Blogger user. Both are able to use HTML sitemap Page but Html sitemap is totally different from XML sitemap, you know. As a blogger, we submit to search engine XML Sitemap for improving ou crawling rate or ger quick indexing of our new blog post. 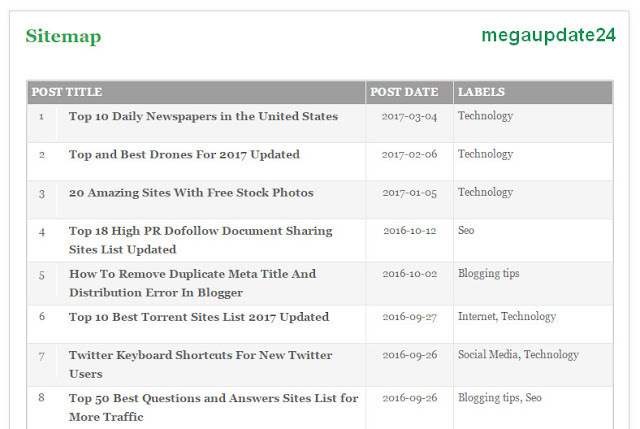 HTML Sitemap shows a nicely organised of your published post on a page. This page just like a table. Including this table post title, post published date, and labels. 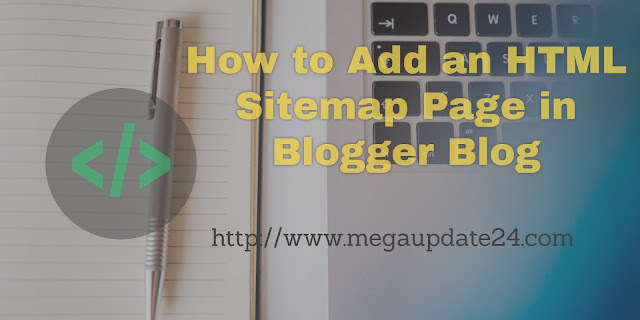 In this post, I will show you how to Add an HTML Sitemap Page in Blogger Blog. I have given you a little bit idea for about HTML and XML Sitemaps in the first paragraph. But now I am clear it's detail before forwarding HTML Sitemap Page Adding System. HTML sitemaps are created with plain Hyperlink Text Markup Language and are the desire for your website visitors. It is usually used to make a list to all the post that are published on your site. By Cheating HTML Sitemap Page you can reduce your bounce rate also. On the contrary, XML created with the XML markup language. By creating XML Sitemap in search engine's webmaster tools. Which improve your site's crawling rate also quick indexation of your site's post URL. You can visit the demo page from the menu of Sitemap or by clicking this link here. To add a HTML Sitemap Page In Blogger Blog please follow the below method. You Should follow two steps. First, you have to Backup Your Site Of any changes. Secondly, need to add the CSS codes for making your sitemap look winsome. Go to Blogger Dashboard>> Theme>> Edit HTML. Then click in the code area and find out ]]></b:skin> tag. Just above it paste the following code which I provide below. You cal also customize the colour code for matching HTML Sitemap page with your template. When everything is done, press Save Template button which you find out the top of your screen. First steps are done, now forward for the second. Now create a new page from Page Menu where you display your sitemap. Process is Go to Blogger>> Page>> New Page>>. In the blogger page editor area, select HTML tab and paste the following code in the HTML code editor. After pasting the code you should write a title of your page by the name of "Sitemap". Also, you can make your comment section disabled if you wish. When everything is done pressing Publish Button and visit your sitemap page with nice looking and you are done. As a simple looking, it looks like below without any colour edit. Now I hope this post tech you for a proper guideline to add an HTML Sitemap page in Blogger Blog. If you have any question don't forget to ask me via comment and if you like it please share it on the social media.